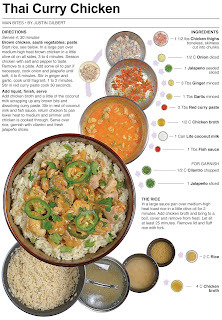 The is my first attempt at creating a Thai recipe of my own. I love chicken thighs in anything, so using them as the protein was a good start for the dish. I used 2 tablespoons of red curry paste and a sliced and seeded jalapeño for heat. I thought that would be enough but I should have used more curry paste and left the stems and seeds in the jalapeño. I would have liked more kick, which means the spice in this recipe is probably spot on for most people because, like I have said before, mild heat to me is most people’s hell fire. 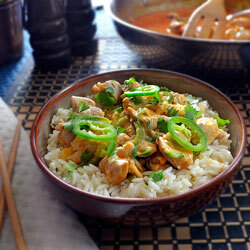 The coconut milk really does a good job of mellowing out the dish. I really like working with it because of the balance it provides. I hope to utilize it in my savory cooking more. 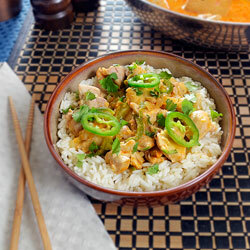 The ginger opens up the taste buds and gives the entire dish a great aroma and flavor. All in all, I really liked this recipe. It was good for a first attempt. In baseball terms I will call this a double into the gap, which I’ll take every time I’m at the plate. It needs a little more love before I can call it a home run though. I would like for the sauce to be a little thicker and I’ll have to experiment with how to accomplish that. I started this recipe the day before I actually created and finished it. I was working on the ginger when a simple slip of the knife while mincing it led to a gnarly cut on my index finger. No stitches were required but, I had to quit for a while to get it cleaned up and bandaged. Every so often that happens when you work with sharp objects. Luckily, it wasn’t bad enough to warrant a trip to the emergency room. The entire day leading up to the knife incident was a fiasco - I took the cut as a sign to give up on the cooking and instead move onto working at the computer. Some times a change of pace is all it takes to make a bad day better, and giving up on the recipe was the right move – the rest of the day went smooth and easy. I made the Thai chicken for lunch the next afternoon and all of my fingers made it through unblemished. Start rice, see below. In a large pan over medium-high heat brown chicken in a little olive oil on all sides, 3 to 4 minutes. Season chicken with salt and pepper to taste. Remove to a plate. Add some oil to pan if necessary, cook onion and jalapeño until soft, 4 to 6 minutes. Stir in ginger and garlic, cook until fragrant, 1 to 2 minutes. Stir in red curry paste cook 30 seconds. Add chicken broth and a little of the coconut milk scrapping up any brown bits and dissolving curry paste. Stir in rest of coconut milk and fish sauce, return chicken to pan lower heat to medium and simmer until chicken is cooked through. 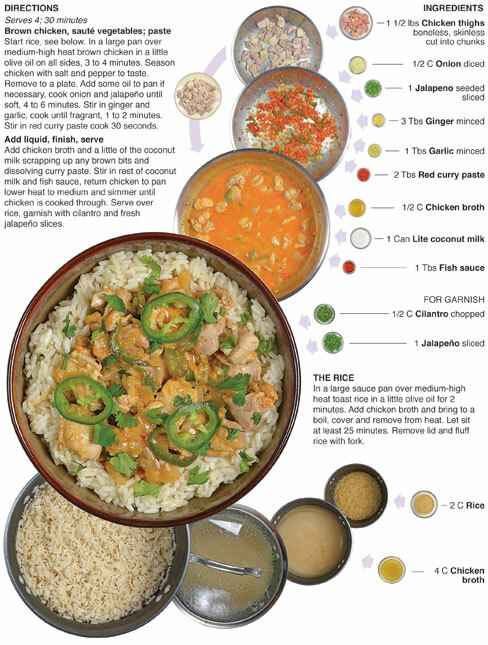 Serve over rice, garnish with cilantro and fresh jalapeño slices. In a large sauce pan over medium-high heat toast rice in a little olive oil for 2 minutes. Add chicken broth and bring to a boil, cover and remove from heat. Let sit at least 25 minutes. Remove lid and fluff rice with fork.